The Teaching for Democracy Alliance is pleased to announce its first webinar of 2017 on the timely and important topic of "Teaching the Presidency in the Digital Age." The webinar will feature Professor Joseph Kahne of UC-Riverside, whose most recent work examines the connection between media literacy education and students' ability to spot fake news, as well as commentary by media literacy experts Dr. Katherine Fry of Brooklyn College and Dr. Paul Mihailidis from Emerson College. The webinar will also highlight free and innovative instructional resources to support teachers as they help their students make sense of the executive branch in today's digital climate. Stream the webinar recording HERE. View the webinar slide deck, with links to many resources is to the right. Kahne & Bowyer research article featured during the webinar. Featured resource (to the right): CloseUp Foundation Lesson Plan: The 2016 Election: What Comes Next? 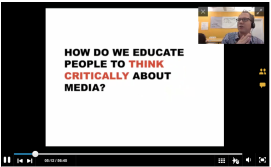 Join us for a webinar on Teaching Media Literacy. Moderated by Dr. Belinha De Abreu (NAMLE), the focus of the conversation will be the "why" and "how" of teaching media literacy especially during this heated presidential election season. The panelists will share resources and tips from their classrooms and organizations. Given the panelists, there will be an obvious focus on news. The panelists include Peter Adams (News Literacy Project), Jules Beesley (The Lamp), and Jeff Share (UCLA). Steam the webinar recording here. ​Moderated by Dr. Belinha DeAbreu, the discussion will focus on how teachers can effectively bring the conversation about presidential debates into their classroom this fall. Renowned media literacy educator Frank Baker (Media Literacy Clearinghouse) and Kamy Akhavan from procon.org will join Dr. DeAbreu to share their expertise and resources. Stream the webinar recording here. ​Stream the webinar recording to the right. 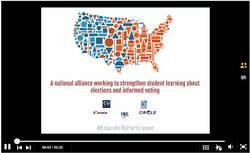 Teaching for Democracy: We Got You Covered: Webinar about the Alliance, resources and discussion about the upcoming year. Stream the webinar recording here. 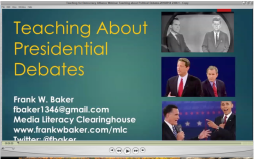 “Bringing Elections to the Classroom” on #sschat. See the archive here.